It hasn’t been too long since my last standard metagame report, but between then and now we’ve had a few Grand Prix and a Pro Tour. The standard environment has completely changed, and what worked before might not continue to work now. I was right on with my insights about Torrential Gearhulk and Grixis control, as well as the weaknesses of Temur Aetherworks. While some of the early decks such as Aetherworks and Vehicles did well during the pro tour, the true break out deck from the tournament seems to be UW Midrange featuring Spell Queller, Archangel Avacyn, Smuggler’s Copter, and Reflector Mage. There were A LOT of them in the top 64 of the event, and they seem to be the perfect answer to a Smuggler Copter heavy metagame and decks with lots of aggressive land creatures but no evasion. While UW midrange and UW Flash decks seem to still make up a large part of the metagame, Mardu Vehicles and GB Delirium are back with a vengeance. In Nagoya, a few other decks have been putting up good results, such as Jeskai control, Dredge, and even UR Spell decks. The ones I haven’t seen though are GW midrange, Temerge, and BW and Aetherwork decks. I guess it’s safe to say that Verdurous Gearhulk just isn’t enough and that the dredge builds of Emerge with Elder Deep Fiend are simply stronger than the original archetype. The onslaught of vehicle decks have also had an impact on other artifact based decks like Aetherworks as well. Not only is the deck too risky to play if you can’t get a perfect hand, but you also run into a lot of people running sideboard cards to deal with artifacts which makes Marvel a huge target. My diary today starts with where I left off in my last article, from October 7th. While I had been using RW tokens for a very long time, it was during this period that I started to see cracks in my build. This was in no small part thanks to RW/Mardu vehicles doing well and causing the metagame to stack against my speed based strategy. I went 3-2 at a 25 person standard event with the deck on the first weekend after my article, beating slower decks like Mardu Midrange, GW Tokens, and UR Thermo Alchemist, but I lost to an early Gisela in a GW Midrange match up and had trouble with a removal heavy UB Metallurgic Summonings deck. The winner of this event would end up being a UB Copter/Dredge deck. For the following 2 weeks I went back to RW Tokens in preparation for Kaladesh Game Day, and even though I did alright at a Friday Night Magic with it (beating Bant Eldrazi and GR energy before losing to UW Control), the results from Game Day were anything but. By this weekend, GR Energy, UW Flash/Midrange, and Vehicle decks were out in full force. The results from the Pro Tour had had a definite impact on the local metagame. I went 2-3 at both the midnight and day time Game Day events I attended. The first one I managed a win against an Aetherworks Marvel and Panharmonicon Combo deck, but then lost to UW flash, RW Vehicles, and GR Energy (taking 68 damage in one turn. Ouch). I drew poorly at this first 24 person Game Day, but even with my “god” hands it was still a struggle with RW Tokens. In the second Game Day tournament I managed to beat a GB Sacrifice based deck and Abzan Midrange, but lost to BW Midrange, GR energy, and UW Flash again. I simply couldn’t deal with flyers and hyper aggressive decks like GR Energy and Vehicles, and my removal wasn’t enough when you take Spell Quellers into account in those UW match ups. While my deck wasn’t prepared for the metagame, I have to say that these top 8s look pretty good. There wasn’t one deck that outright dominated the others, and there were many different strategies to choose from. There was even a control deck in the top 8 of both tournaments, so that’s a good sign. Aside from the GW midrange and BR aggro decks, I think that you can count on the Kaladesh metagame to made up in some way or other of these types of decks. Vehicles, UW Flash, and Dredge are here to stay. After such a disappointing Game Day, I was ready to try anything. There were a couple of other decks that I had faith in and believed could turn the metagame on its side, but I was held back by financial constraints. I simply couldn’t afford 4 Liliana or 4 Torrential Gearhulk so I had to make do with what was available to me. I had collected a good amount of red and white cards during release day, as well as green and red. Since I had just finished getting my head beat in with RW, I thought I should try to give my GR Delirium deck another chance. As I said before, the deck had been fun but it had been missing something to give it an edge. It needed more consistency, more threats, better defense, and a well tuned sideboard. I talked with my fellow cardboard samurai Ben Lee, Eli Kaplan, Chris Schiber, and a number of other people in town about what could make my deck better. After a week or so of testing, I came up with a deck that I believe would be strong against UW Flash, most of the midrange decks, and control as well. Mardu/RW Vehicles might still be tough to deal with, but it should give me a much better shot at dealing with the metagame. The core of the deck is still GR Delirium. You can fill up your graveyard quickly with Grapple with the Past and a number of other card types, but what makes this deck work much better than before are its enablers. 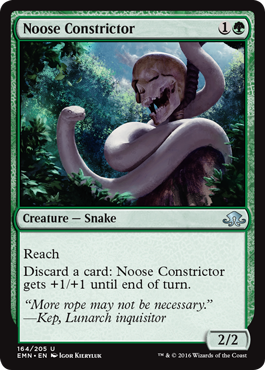 First off we have Noose Constrictor, which is not only a great enabler because it lets you discard any card type you need for delirium, but also because it’s a great blocker against UW Flash’s spirits. Heck, it can even block an Archangel Avacyn. Vessel of Nascency helps to add to the delirium count, but also works similarly to Grapple With the Past except you can grab more card types. I wasn’t sure if I should split Traverse the Ulvenwald and Vessel at first, but when I saw how much I was able to put in my graveyard and get back through Grapple and Vessel, it seemed like I was better off with the split. 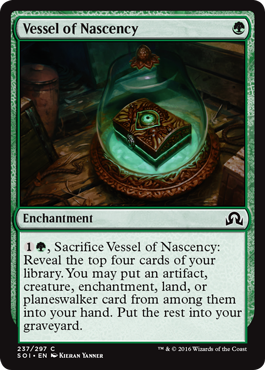 The best reason for using it is to help you play a 6 mana Emrakul, the Promised End (artifact, enchantment, land, instant, sorcery, planeswalker, creature). While these two cards have been performing well, by far the biggest surprise of this deck so far is Sin Prodder. I had previously used Tireless Tracker in this spot, but I ran into the problem of Tracker getting taken out by removal or simply not having lands to play. I decided to try out Sin Prodder instead and I haven’t looked back since. Early on in the game, Sin Prodder is a great source of delirium enabling. Your opponent will throw away your lands, your small creatures, and some of your removal, but all the while you’ll be building up your delirium count and after a few turns it turns into pure card advantage when your opponent can no longer take its damage. His incremental damage builds up quickly, and you can be certain your opponent won’t be taking 5+ damage from the larger creatures in this deck which ensures that you can keep your win conditions in your hand. The more you have on the table, the more dangerous they become. As for the mana creatures, I had tried out Cultivator’s Caravan but it was mostly just a dead mana rock most of the time. Deathcap Cultivator seems like the better choice here, especially since it also gains deathtouch and becomes a good blocker later in the game. Ishkanah, Grafwidow is also a great metagame call right now. It is a nightmare for UW Flash decks, and it does pretty well against other aggro decks as well. The biggest change from the last version of this deck is the addition of 2 more Combustible Gearhulk instead of Ulvenwald Hydra. Thing of this as the big brother of Sin Prodder. It’s a double threat in this deck, and if your opponent underestimates the construct they are in for a world of hurt. I would say that most of the time you’ll be drawing 3 cards with the Gearhulk’s ability and having a 6/6 first striker on the table, but if somebody is crazy enough to play Russian Roulette and put 3 cards in the graveyard, they could end up losing the game. In a recent PPTQ event I managed an 18 point kill against a control opponent when I flipped over an Emrakul, the Promised End and an Ishkanah. 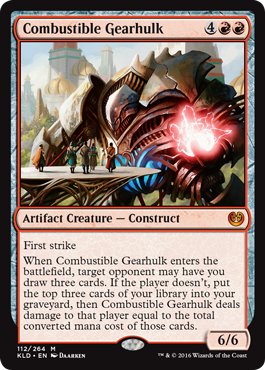 Between Prodder and Gearhulk, you’re looking at quite a lot of compounded damage. There have been games where I didn’t even have to attack and I won. That’s how powerful its ability is. (Thanks to local player Goto Yuusei for the advice). As for removal, I still feel that Galvanic Bombardment is the best call since it works well when milled or when you draw it early. It’s been good against Vehicles and UW Flash for me so I’m going to keep playing it. I originally had Collective Defiance in the deck but dropped it in favor of Incendiary Flow. This is more of a metagame call, as the number of BR and UB Dredge decks have multiplied in the last week or two. Having a way to get rid of a Prized Amalgam forever is nice, plus I can hit an opponent for 3 damage if I need to. If you wanted to, you could possibly run Collective Defiance or Harnessed Lightning, but it depends on your metagame. Harnessed would do well in a Copter/Spirit heavy meta, and Defiance seems more like a GB Delirium/UW Control type of card. Chandra, Flamecaller was moved to the mainboard mostly due to the sheer number of UW Flash and Mardu Vehicle decks out there. You have to watch out for Archangel Avacyn and Selfless Spirit of course, but otherwise I think it’s a better card to have in the main deck instead of Arlinn Kord. While the haste ability was nice, she had a tough time living against both of those aforementioned decks so she’s been relegated to the SB for slower midrange and control match ups. The sideboard has changed quite a bit, with Arlinn and Chandra being just the tip of the iceberg. Nissa is still there, but almost everything else is different. Clip Wings is in there instead of Take Down, Commencement of Festivities is a must for GR Energy match ups where you can die out of nowhere, and I decided to try out the other 2 Incendiary Flow for those grindy dredge match ups. Omnath, Locus of Rage is still here of course because I feel like he is good against both control and slower midrange decks like BW, and I also think that Greenwarden has some good synergy as well. Besides being an elemental that does damage when it dies with Omnath in play, it has good synergy with this deck by allowing you to get back non creature cards that you can’t get with Grapple with the Past. The deck still lacks an good board wipe that you can cast early, but I feel like Radiant Flames just isn’t what this deck wants to have on turn 3 against aggro decks. As for results, the decks has been doing much better than before. Aside from the tough match ups against Mardu Vehicles, it’s been handling control and UW flash/midrange decks rather well. I went 2-2 at a 19 person tournament, 3-4 at a 67 person PPTQ, and 2-1 at a casual standard tournament with previous builds of the deck. There is still a lot to learn about the match ups and sideboarding, but there is enough potential (and enjoyment) that I see myself working towards optimizing this deck even further in the coming weeks. I’m confident enough that I’ll be able to start churning out winning records soon, and by then I’ll hopefully have a SB guide as well! When I said I was tired of getting beat with my RW tokens deck, I didn’t mean that I was tired of RW altogether. On the contrary, I believe the color combination is incredibly deep and that aggro isn’t the only strategy that you can use with it. I’ve been working on a new deck with a couple friends of mine and the current vision is built to take care of these creature laden aggro decks and slowly put the game out of reach for them. Like any control deck, this deck wants to keep creatures off the table and away from your life total. I decided to build this deck with a semi-madness theme and used the combination of Lightning Axe and Fiery Temper. I did this first and foremost because I feel like it’s better to have instant speed removal than sorcery speed. Both Geier Reach Sanitarium and Drownyard Temple complement this strategy well, and you can get some good use from Nahiri +2 activations too. Nahiri also works very well alongside Thalia, Heretic Cathar by exiling whatever creature comes into the battlefield tapped. The other removal I decide to go with was Declaration in Stone (good against indestructible effects and Eldrazi), Fumigate (needed for UW flash and vehicle match ups I think), and Oath of Chandra (with 10 Planeswalkers, why not?). 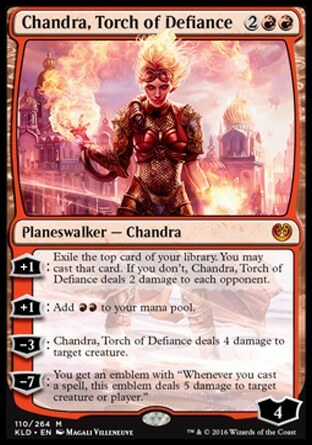 Gideon does a great job of both protecting himself and being a threat, but the card I’m looking forward to playing with more is Chandra, Torch of Defiance. Besides being able to win with Gideon and removal, there is a secondary strategy to the deck: Angels. You’ll probably be using her first +1 when she comes into play deal damage to an opponent or her -3 to kill a creature, but come turn 5 you can realistically ramp from 5 mana to 7 and play either a Linvala, the Preserver or Bruna, the Fading Light. This can be huge against faster opponents since both will most likely put an extra body into play and make it very hard for the other player to kill you the following turn. There is enough removal and other targets in this deck that I think you can realistically build towards her ultimate and quickly end the game. 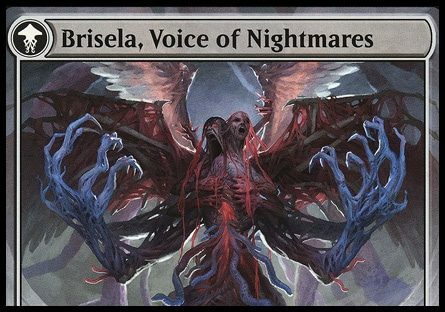 If Planeswalkers and removal don’t do it, merging a Gisela and Bruna together into Brisela will quickly end the game as well. Once she flips, it will be hard to kill her short of a board wipe since your opponent won’t be able to cast any spell that costs 3 or less. Between Brisela, the other Angels, and the planeswalkers this deck will have no shortage of win conditions, but the real challenge is going to be finding the correct amount and type of removal to keep the threats from your opponent in check. However, the two cards I look forward to playing against control based decks are Bruna and Emeria Shepherd. 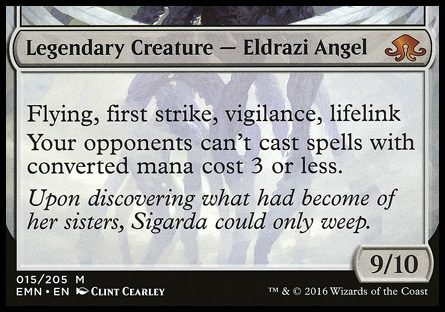 We all know what Bruna does (returns a human or angel to the battlefield), but I don’t think people have ever giving Emeria Shepherd a chance in standard. 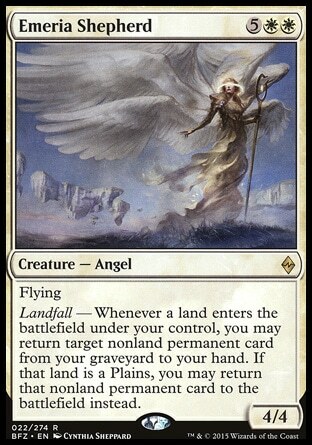 While it’s not incredibly overpowered as a 4/4 flyer for 7 mana, it does have the amazing ability of returning a permanent to the battlefield whenever you play a plains, and if it’s any other land you get to play that card again. Being able to cast this and get back a Chandra or a dead Bruna (which in turns gets you back another creature) seems incredibly useful in those long games where any and all types of card advantage are important. I look forward to trying it out and getting a lot of use out of it. 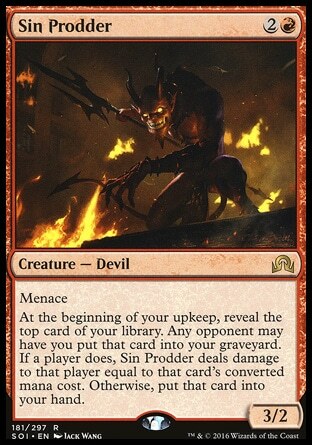 Another card that shouldn’t be overlooked is Descend Upon the Sinful. This deck already has main board Fumigates and a lot of removal, but when you run into dredge decks that simply won’t stay dead, having a way to permanently exile them can be very useful. I think this deck card would also be good in those GB Delirium match ups that have lots of ways to manipulate their graveyard. Get rid of their enablers and you’re good to go. PPTQ season is just starting to heat up and you can be sure that the decks I talked about in the past few weeks’ metagame will be out in force. I expect UW Flash and Vehicles to continue flooding metagames everywhere in the coming weeks, but I also think that GB delirium, BW midrange, and UW/x Control will push back and force us into a mexican standoff. Everybody will be shooting for one another and our metagames will shift greatly from one week to the next. I’m hoping that one of the decks I talked about today will end up doing well for me and do a good job of handling the metagame. Whatever happens I’m going to try to enjoy playing standard, and if you’re looking for something different and interesting to play I recommend putting together these decks and trying them out. You just might enjoy them! That does it for today’s article, but if you have any suggestions or comments please be sure to leave them down below. I’ll be back with more standard articles in a few weeks, but until then be sure to check back in the coming days for more Frontier news as well as some peaks into Legacy and Modern from the Nagoya area and around Japan.